What is Red Rubber Grease, such as Castrol and Girling, why and how it is used for hydraulic brakes, clutch and suspension lubrication. Technical information and selected applications. 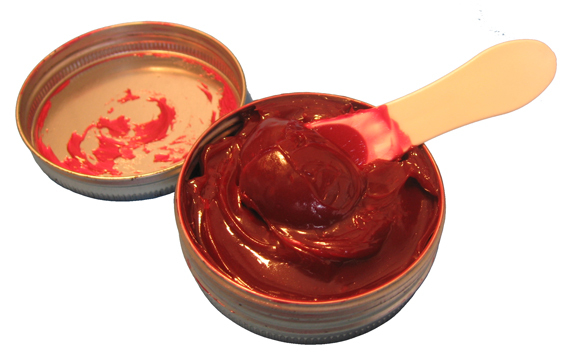 The purpose, features and uses of red rubber grease. Why do we need Red Rubber Grease? Rubber without lubrication dries out, hardens, crackles and breaks. If affected by gasoline or if lubricated with petroleum-based grease, it swells, loses its shape and does not do the work as intended. When in contact with moving parts, it wears out from friction (an o-ring against a brake caliper or cylinder piston, a dust boot against a clutch plunger) and also may rupture. And, finally, during assembly, it is hard to push a piece of dry rubber into a casing and even more so to slide one rubber part onto another. To help in all of the above situations red grease was designed, Castrol RRG being one of the best known brands. Being a vegetable oil based lubricant this grease does not harm rubber and can be used for its protection, lubrication and preservation. It can also be a great help during assembly of units containing parts made of natural or synthetic rubber and even plastic (installing bushings, for example). Because of a unique combination of two of its qualities: natural rubber compatibility and brake fluid compatibility the main use of Red Rubber Grease is in hydraulic brake/clutch applications. What is the main purpose of RRG? Preserving natural rubber parts, lubricating rubber to rubber or rubber to metal contacts, helping in assembly of units containing rubber parts. Because of the qualities mentioned above Red Rubber Grease it is ideal for use in hydraulic systems, namely, hydraulic brakes and clutches or shock absorbers, pneumatic systems containing rubber parts (o-ring, seals). For this reason a sachet of the red grease comes as a standard part of quality brake/clutch and motorcycle fork oil seal and dust seal repair kits. In other words, RRG can be used for lubrication where there is rubber and there is no gasoline: o-rings, non-petroleum oil and dust seals, dust boots, bushings. Read the technical specs and MSDS of Castrol red rubber grease and also of RRG from such manufacturers as Millers Oils and Fuchs on our Tech info page. Learn how to use rubber grease when rebulding brake calipers. Learn how to use rubber grease when rebulding clutch master cylinder.